As the photographer snapped away her youngest daughter, Maddison (3), decided to show off a new trick she'd learnt. 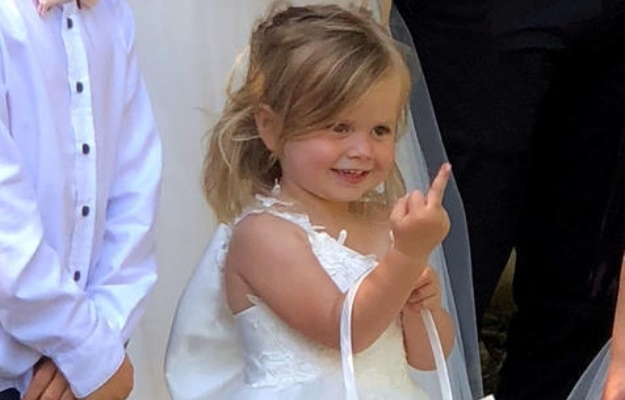 A mom was left mortified and red-faced when her cheeky little daughter hilariously popped the middle finger during a family photoshoot on her wedding day. Like most brides would, mom-of-four Hannah Earley had organised a professional photographer to capture beautiful pictures of her special day in November last year. 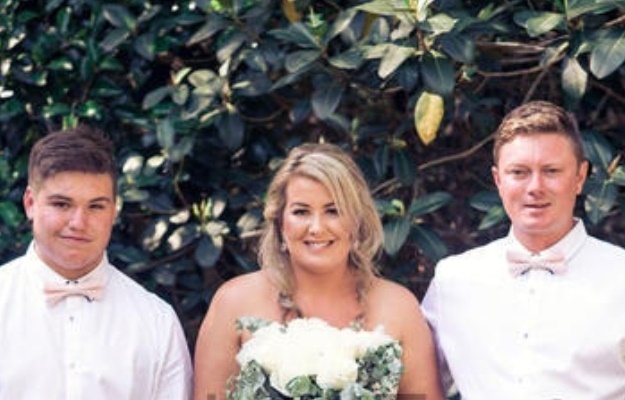 The 33-year-old, from Old Bar, New South Wales in Australia, said she was very happy to be tying the knot with Nathan Earley (31) and excited to get her family together for wedding day photographs. Standing perfectly poised in her elegant white wedding dress and holding a bouquet of flowers, the mom took her new husband's hand and gathered up her four children for a wholesome family portrait. One she hoped to hang on the wall one day! As the photographer snapped away her youngest daughter, Maddison (3), decided to show off a new trick she'd learnt -- and popped her middle finger up to the camera, making the snap truly unforgettable. “There were lots of people standing around watching her so I think she just thought, why not do it,” Hannah said. She said her daughter had “learnt that little trick just a few days before” but didn't say who from . “She knew she'd get a strong reaction from it,” the mom added. According to Hannah the photographer had deleted the shot but her sister, Sharon, managed to capture the moment on her own camera. Maddison tried her trick again two weeks later at her elder sister’s graduation from daycare ceremony. “She did it for nearly a month straight. It was funny but I'm glad she's stopped doing it now,” Hannah told the Daily Mail. “It was really hard not to have a giggle, but I didn't want her to think it was okay. I had to always turn away from her and laugh so she wouldn't see me.